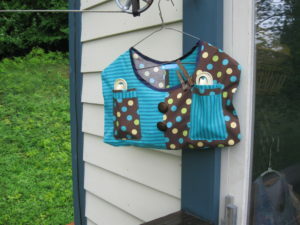 This clothespin bag design began from my needing to get my clothesline spacers out of my way when reaching in for pins. The pockets in front hold the spacers handily until you need them. After I made one of these bags for myself, friends started wanting them. So this line of bags was born, as well as paper and PDF patterns (printable at your end onto 11 x 17 inch paper) if you want to make your own from a favorite fabric. My favorite part of making these bags, after choosing the main and trim fabrics, is deciding on the buttons. They come from my huge collection, amassed over the years. I never know where this process is going to lead! The images below link to my Etsy Page where you can purchase my Clothespin Bags. Use your browser back button to return to this website.